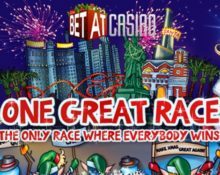 Betat Casino – One Great Race! This race will have winners only! And everybody will be a winner! 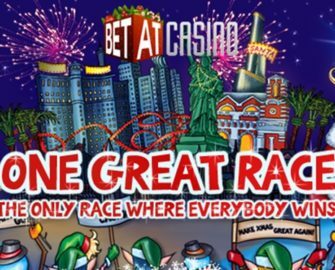 To conclude their immensely popular and rewarding Christmas campaign Betat, the acclaimed Santa casino, is inviting all players to a 3-day slot race for cash prizes, iPhone 7’s, Amazon vouchers and huge amounts of Free and Super Spins. The best part is that everybody will win a prize, there will be nobody going home empty handed. The winner though will walk away with a presidential €1,500 in cool cash. Not yet gaming at Betat? Then sign up now and claim their superb €500 Welcome Package. Take part in this proper 3-day slot race at Betat as everybody will win a prize. Running from 17:00 CET on 29th December 2016 until 23:59 CET on 1st January 2017 the race will have one 1st prize and all other participants will be entered into a raffle for a guaranteed prize. The overall winner will be the player accumulating most spins at any bet size on any slot in the Betat portfolio within the promotional period. Both real and bonus funds count towards the race. A live leader board will be updated in real time and shows the TOP51 positions only. First prize is €1,500 in cash while raffle prizes include 1 x Playstation Console, 1 x Samsung Galaxy 7, 1 x iPhone 7, 1 x £500 Amazon, 1 x £250 Amazon, 1 x Track Racing day, 10 x Family cinema packs, thousands of Free Spins and Super Spins. Every participant will win a prize. Launched in 2011 the award winning casino is operated by NRR Entertainment Ltd. and holds UK and MGA licenses. Casino games are available on desktop, mobile and tablet and provided by Netent, Microgaming, NextGen and Leander while the Live Casino tables are from Netent. A huge variety of currencies and payment methods such as credit / debit cards, instant banking, Ecopayz, Neteller, Skrill, Paysafe Card and Bank Transfer ensure fast and secure deposits and withdrawals. The website is available in English, Finnish, Greek, Portuguese, Russian and Spanish languages while professional customer support is provided by Phone, Email and Live Chat (not 24/7).